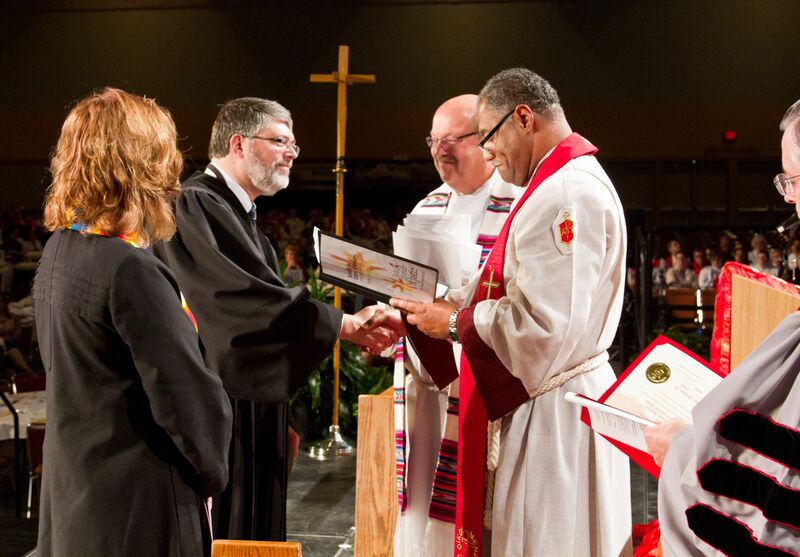 Here is a photo from the Service of Ordering Ministry in which my ordination is recognized and I receive Provisional Membership in the Iowa Annual Conference. I am shaking hands with Bishop Julius Trimble the resident Bishop of the Iowa Annual Conference. Standing next to him is Rev. Robert Burkhart, Assistant to the Bishop for Administration. Standing next to me is a pastor who was having her orders recognized and being commissioned as an Elder in Full Connection having served in the UMC for some years. During the Service of Ordering Ministry Elders and Deacons were ordained, Provisional Elders were commissioned as well as persons serving in all different facets of United Methodist ministry. It was a very moving and enjoyable worship experience. This entry was posted in United Methodist Church on June 8, 2011 by Tim.